In this video, we will learn how to create a simple circuit composed by different devices the EMTP Works libraries. In this video, we will first run a time domain simulation of a single phase circuit without initialization. In this video, we will first perform a frequency-scan simulation and visualize the waveform by using MPLOT. 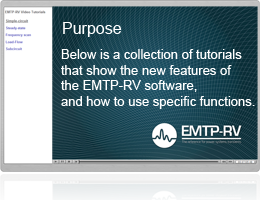 In this video, we will present the EMTP-RV Load-Flow devices and there properties. In this video, we will create a subcircuit, composed by a voltage source and a RL impedance. In this video, we will view and analyse simulation results with ScopeView.